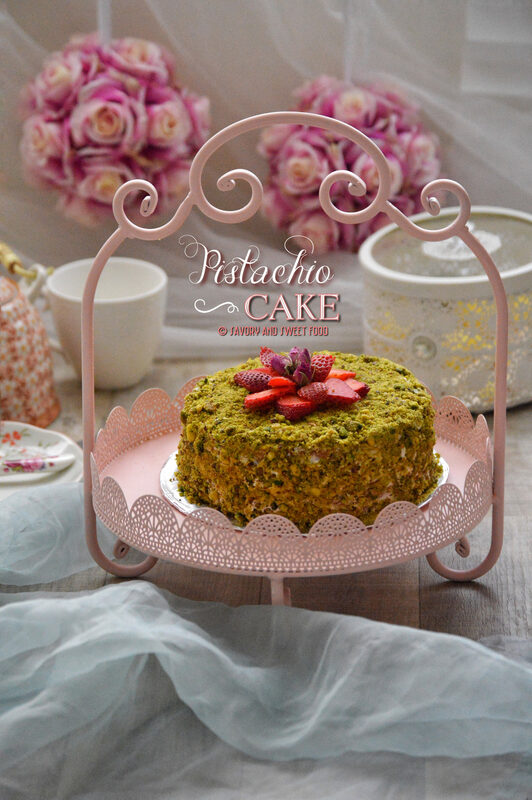 This Pistachio Cake with creamy and rich Rose Water flavored Mascarpone frosting is a true celebration cake. 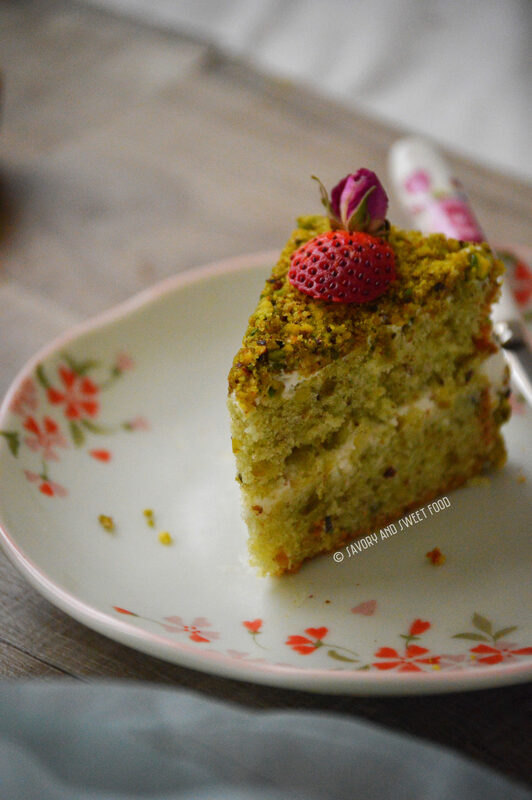 The taste of pistachio in this moist cake and the delectable frosting is just too good. I keep hearing “2017” and feel that it is in like 5 years. But here it is, the countdown ended…fireworks extinguished and the New Year has arrived. Im sure all will be ready for all the positive things that you would want to see accomplished in the coming 12 months. It is that time of the year when everyone starts making resolutions that we’re supposed to keep for whole 365 days. I have made some too. Hope I can stick to it. So lets go to todays recipe. 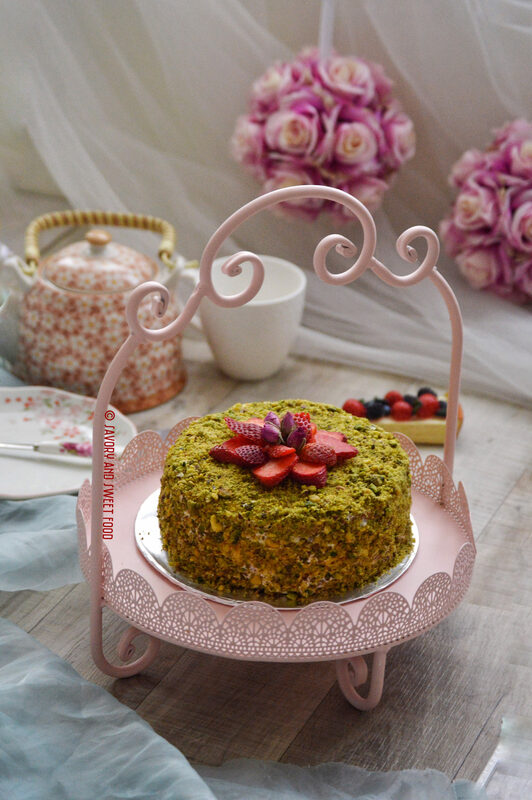 This very beautiful cake is a Pistachio cake with Mascarpone- rose water frosting. This is one of the best cakes I have made so far. 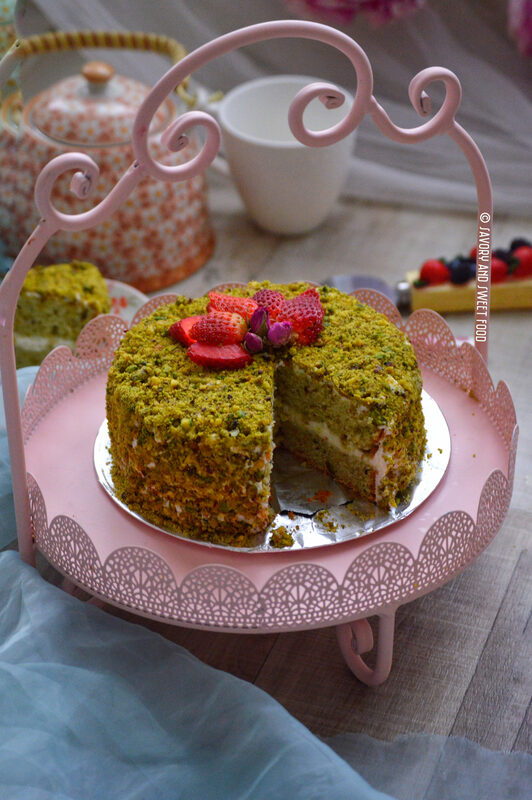 I had tried this amazing pistachio cake from a bakery here in Kuwait named Mr. Baker and I have been trying to recreate a similar one for sometime now. 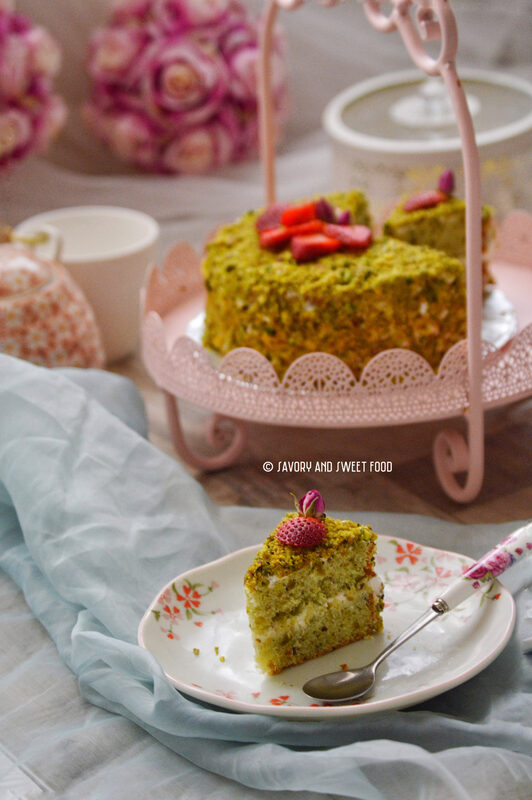 I did try few other pistachio cake recipes and it didn’t come out that well. This cake tastes 90% like the bakery one. I made this cake twice already. It tastes amazing with the frosting but it is equally good without it too. With this quantity you will get a 6” inch cake. If you are using an 8″ or 9” cake pan, the cake won’t be very thick enough to slice it into two halves. But if you do not want to frost the cake, it would be fine. You can make cupcakes out of it too. This was a cupcake recipe originally. The baking time will vary depending on the size of pan you are using. For a 6” pan, it will take about 40 minutes. But for a 8-9” pan it will take less time (30-35) minutes. If you are making cupcakes it will done within 17-20 minutes. If you are making cupcakes then it would be better if you add the frosting to the cake just before serving. Preheat oven to 170°C/ 325°F. Slightly grease a 6” baking pan with butter. Dust with flour. Whisk or sieve the flour and baking powder. 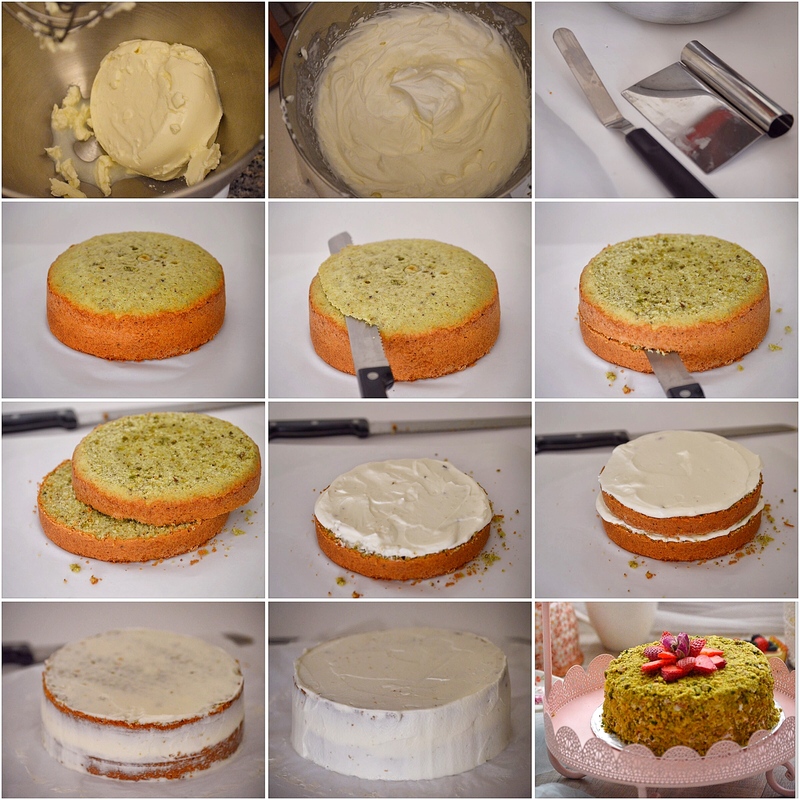 Add the ground pistachio nuts to it and mix well to combine. In a bowl beat sugar and butter together until it turns pale and fluffy. Add in the eggs, one at a time beating well after each addition. Add green food coloring if using. Beat in the milk and a spoon full of flour mix. Fold in the remaining flour mix. Pour the cake batter into the cake tray. Bake for 35-40 minutes till the cake gets set and a toothpick inserted comes out clean. If you are using 8″ or 9″ mould read notes. In a bowl whisk together the heavy cream, mascarpone, powdered sugar, vanilla and roses water for about 3 minutes. The consistency should be very fluffy. It should hold stiff peaks. Take cake and cut a thin layer of cake from top, to obtain flat top. Spread frosting on top of one half of cake. Keep the other slice of cake on top. Spread the frosting on the top and the sides with a spatula. Make the sides and top frosting smooth with a cake scraper. Refrigerate for 15 minutes. Take out the cake and once again add frosting to the entire cake (sides and top). Smooth it well. 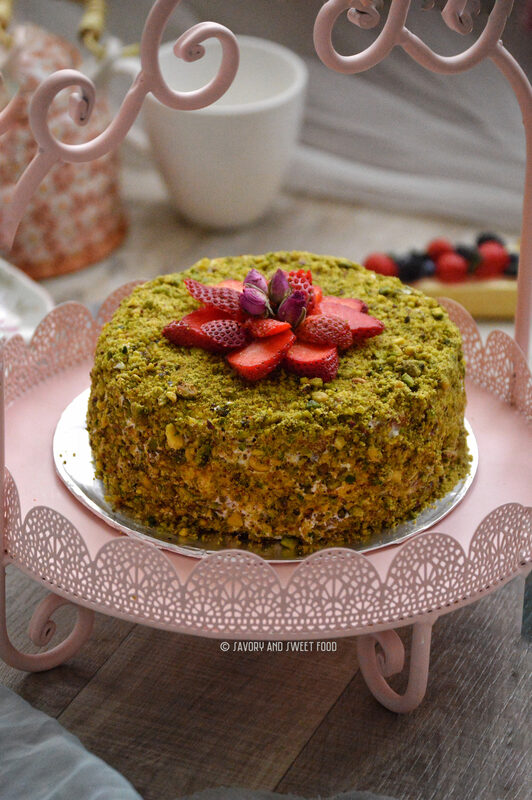 Decorate the entire cake with powdered pistachios. Bake for 35-40 minutes till the cake gets set and a toothpick inserted comes out clean. If you are using 8" or 9" mould read notes. With this quantity you will get a 6” inch cake. If you are using an 8" or 9” cake pan, the cake won’t be very thick enough to slice it into two halves. But if you do not want to frost the cake, it would be fine. What an amazing props and clicks….and the cake looks so moist and very different…. Thank you very much Shazia! Thanks a lot Rafeeda . I love nutty cakes too. Can I use something else Instead of mascapone cheese? Will normal cream cheese work? If no, can you suggest a frosting that would go with this.. thank you.. Yes, you can replace with cream cheese but it will taste like a cream cheese frosting. Mascarpone is a light flavored cheese. You can make frosting with only whipping cream too. Just make sure that you whip it up really well till you get stiff peaks. And how deep is t ? The pan I used was 6 inch by 3 inch. what size do You suggest for 10 Persons? I would suggest doubling the ingredients and making it in an 8″ pan. You can do three layer cake. Sorry for all the msg’s but 8 inch and how deep? I am sorry I missed this message. I would recommend baking three cakes separately in a 8″ inch cake pan. Or make one medium thick cake in a 8 by 2inch pan. Cut it into two. And make a thin single layer cake in the same pan. So you will get three layers. 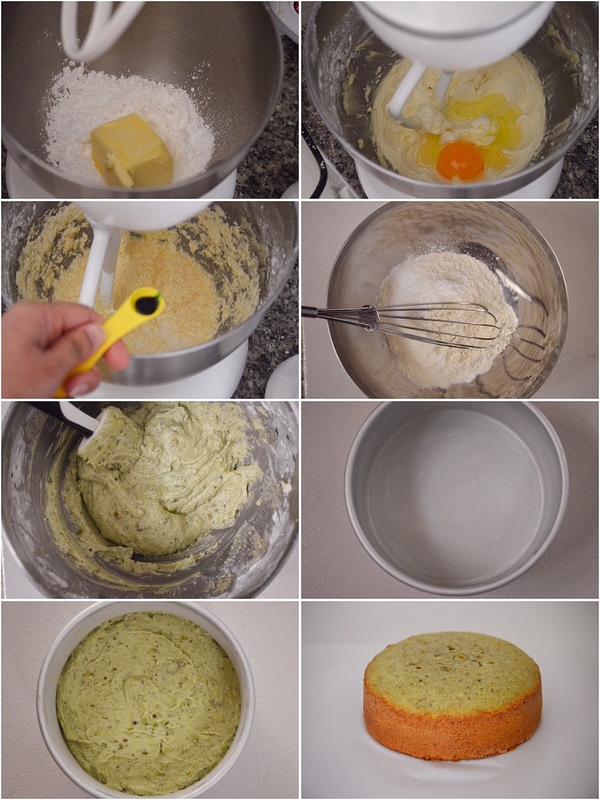 And the third option is to make one big cake in a 9″ by 3″ cake pan and slice into three or two layers. A wonderful Cake indeed ! Pistachio is one of my favorite flavors in sweets.. can you post the ingredients in cup measurements plz ? Thank you . Will post the measurement in cups sometime soon. Sorry for the late reply.